I know you've all been dying for my overall impressions of pie week. It's been nice to have the last few days to think over it. 1. Butterscotch-- I can't help it. It's just so ridiculously yummy. 2. Black-Bottom Pie--the chocolate wafer crust, the rum meringue...it was all too much. Delish. 3. Apple Pie: can't beat it. 4. Chocolate Pie. mmmmm mmmmmm there's nothing like a good chocolate pie. Granny will be bringing one to Thanksgiving dinner tomorrow and I will probably eat more than one piece, just so you know. There's not a large margin of favor between the above ranks; it was a close close close close call. The question I've gotten the most has been "what was your favorite crust?" The Martha Stewart Pate Brisee and Pioneer Woman's Perfect Pie Crust weren't drastically different in their tastes. The main difference was in the method. Personally, I was more comfortable making Pioneer Woman's crust with the pastry cutter because it was less dangerous. When using the food processor for the Pate Brisee, it seemed really easy to mess up: over-pulsing, adding too much water because you can't see, or overworking it. With the pastry cutter, you can see exactly what you're doing and there's not an appliance that could get away from you. Also you can gauge the water amount better. Too much water, and the crust is sunk, over with completely. Garbage time. I LOVED the Buttermilk Crust with the apple pie, but that was very unwieldy and less of an everyday crust than the other two. The buttermilk taste was the perfect accompaniment to the apple filling, though. The guy doesn't usually just looooove chocolate, so these sorta surprised me. He loves his food to have a crunch, which is why the Black-Bottom Pie found so much favor with its crunchy chocolate wafer crust. Invaluable baking equipment: pastry cutter (see commentary re: fave crust above) and I loved having the 2" deep pie pans from Lit. I copied and pasted all of the ingredients from all 7 recipes into one word document. 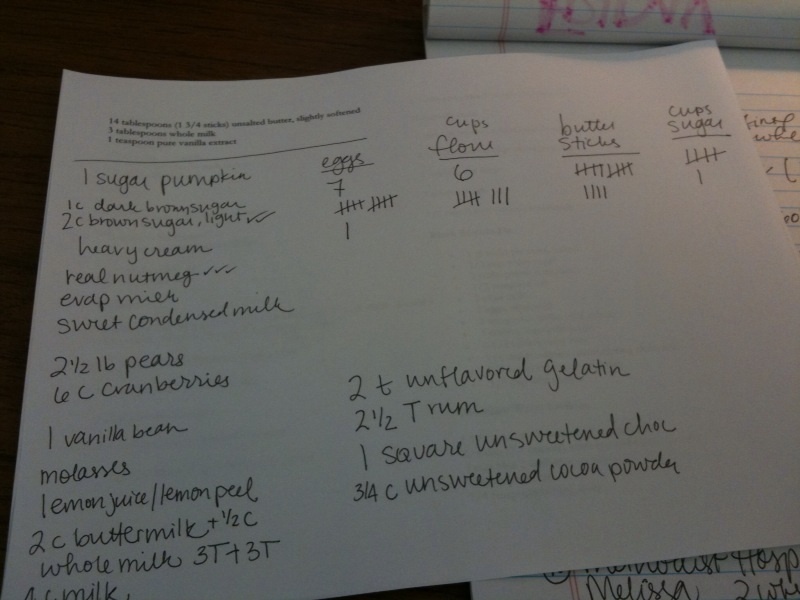 Printed it out, and then took a tally of the groceries I'd need, by cups of sugar, sticks of butter, etc. Only made one last-minute trip to the store. Has to be some kind of record! Will I ever do Pie Week again? Not any time soon. I've got a few smaller-scale holiday baking projects coming up. Maybe next year, I'll consider doing a summer edition. We'll see. So thank you for following me last week in my pie adventure: mishaps, successes, and all. If nothing else, I hope to have proved that homemade pies are more accessible than you may have thought they were. Happy Thanksgiving to all, and eat some pie! my fave part of pie week has got to be your reviews of the crusts. crusts intimidate me, so i'm glad to know which recipes are winners! i may bake a thanksgiving pie just for funsies, since other relatives are already on top of that for tomorrow. you have totally inspired me! so admire your determination and follow-through with this series--I know how much work and time and focus it takes. I hope you have seen or will watch the charming, pie-heavy movie "Waitress"! No seriously, I need to attend your perfect pie crust class.